With the exception of landscaping and some minor interior and exterior finishing work, the new $7.8 million, 28,200 SF Cayuga Medical Associates medical office building is practically complete. A bit later than first anticipated, but one of the largest projects Ithaca’s McPherson Builders has taken on, so congrats to them for getting the job done. Kudos to HOLT Architects as well, for creating something that looks as good if not better than the renderings. If you read down this far, thanks! Here’s what you get for your trouble. I’ve long touted the concept plan for a denser, mixed-use Community Corners. There appears to be some real progress on that front. Here are some concept renders for “Upland Heights”, a proposed retail and condominium development on vacant land next to the existing Community Corners complex. It is a sketch plan and the formal proposal has only been partially submitted (postponed a month), so no Voice write-up until there’s enough firm documentation to go with the renders, elevations and site plan. In terms of walkable mixed-use to the commercial neighbors and design aesthetics, it could use some work, but it at least shows serious development plans are underway. A denser, mixed-use Community Corners is looking increasingly plausible in the years ahead. The new Cayuga Medical Associates office building at Community Corners is topped out – I’m a little hesitant to call it fully framed since it appears some minor work remains at the southwest corner of the new 28,000 SF building. Steel stud walls are being sheathed in Saint-Gobain CertainTeed GlasRoc, one of the major suppliers of fiberglass mat gypsum board. 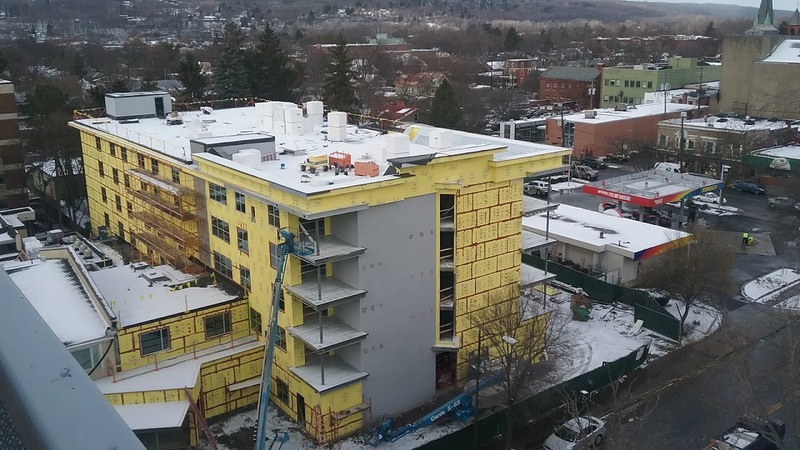 True to name, the boards consist of a sheet of woven fiberglass sandwiched between gypsum panels; brands like GladRoc and Georgia-Pacific DensGlass are fairly common for commercial construction where fire-rated walls are a necessity, like medical spaces, offices and hotels, and it does show up in some apartment buildings. The exterior will be finished with an off-white brick veneer, a nod to neighboring structures. Interestingly, the entirety of the gable roof sections appears to be standing seam metal over some kind of base layer. More expensive, but definitely making it such that in the event of fire, there is as minimal ability to spread and put vulnerable individuals at risk. Ward Steel of Liverpool appears to be the subcontractor for the structural steelwork. The interior work doesn’t seem to be too far along yet, with interior framing underway, and maybe fireproofing of the structural steel or sprinkler installation underway. The construction work hanging out by the rough window opening in the photos below said that they hoped to have the building finished by late fall. McPherson Builders of Ithaca is the general contractor for this project, and Chemung Canal is financing it to the tune of $7.8 million – a better use of funds than the million bucks they had to pay out to Jason Fane when they lost the Bank Tower lawsuit last year.